I lived in Germany for about five or six years in the nineties. In all that time, while I was ensconsed in the beautiful Black Forest town of Freiburg, I never once made it to the capital. Now I’m finally here. I was invited to come to Berlin to be part of the jury for the highly-prized Biene awards. This is quite an honour. 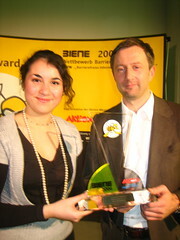 In the Biene awards, the emphasis is on accessibility and the criteria are really quite strict. It’s no cliché to say that just being nominated is quite an achievement. One of the restictions on entries for the awards is that the site is primarily in German. I suspect that it’s my familiarity with the language that secured my place on the jury. The only problem is that I haven’t spoken German for six years. Yesterday was judgment day. The jury gathered to debate and discuss the relative merits of the sites on offer. I had absolutely no problem understanding what everyone else was saying but as soon as I opened my mouth to add my opinion, I found that words and grammar were failing me at every turn. It was quite frustrating. I know if I was here for a few more days, it would all come back to me but having to dust down the German-speaking part of my brain after an interval of half a decade felt like quite a tough task. I learned most of my German from sitting in pubs chatting with Germans, which is why I’m still fairly crap at reading and writing in the language. I usually find that my German improves greatly after one or two beers. Strangely though, after another three or four beers, I can’t understand a word anyone is saying. Komisch, nicht wahr? The prize-giving ceremony will take place tonight. I can’t give away any of the results yet; that’s verboten. But I’ll definitely be blogging about some of the sites as soon as the pre-ceremony gag order is removed. Until then, I have a few hours to explore Berlin. The good people from Aktion Mensch are putting me up at the ludicrously swanky Westin Grand, once the crown jewel of East Berlin. Its central locataion means that I’m just a short stroll away from the Brandenburg gate and plenty of other must-see attractions. Flickr demands pictorial evidence of such visual delights: I must obey.